Sad and angry. That's how I feel. First, the sad part: Dennis Johnson dropped dead Thursday at the age of 52. I never met him and only followed his career from afar, most notably when he played for my beloved Celtics, so I won't pretend to be as distraught as his family, friends and former teammates. My condolences to everyone who knew him and loved him. At the same time, I am sad, and he's a guy who meant an inordinate amount to me during a time when sports probably meant a little too much. Maybe I wasn't part of his life, but he was a huge part of mine. So it's a sad day for Celtics fans (as well as his fans from Pepperdine, Seattle and Phoenix). As one of my friends e-mailed me today, "It's really hard to dodge the feeling that someone in control has just decided to [bleep] with the Boston Celtics this year. Really hard." Johnson won titles with the Celtics in 1984 and 1986 and the Sonics in 1979. Now, the angry part: DJ passed away before the Basketball Hall of Fame found a place for him. He's going to make it within the next few years -- probably in 2008, when everyone gives him the proverbial sympathy vote (this summer's finalists have already been announced and he wasn't one) -- and they'll have the ceremony without him in Springfield, Mass., and everyone will say, "It's a proud day, but it's also a bittersweet day because DJ wasn't here to see it," and then they'll put up his plaque and we'll go on with our lives. Not acceptable. He should have made it already. I wrote about this ongoing injustice last fall, when Joe Dumars made the Hall with credentials that weren't any better or worse than DJ's resume (or Sidney Moncrief's, for that matter). It didn't make sense then and doesn't make sense now. DJ played 14 seasons, made five All-Star teams, won the 1979 Finals MVP and three rings overall, and made All-NBA first-team in '81 and All-NBA second-team in '80. Dumars played 14 seasons, made six All-Star teams (in a weaker era of players), won the 1989 Finals MVP and two rings overall, and made the second-team All-NBA in '93. But this isn't about Dumars vs. DJ -- it's about a great basketball player who never got his just due. 1. Indisputably, DJ was the greatest defensive guard of his era: Nine straight All-Defensive appearances from 1979 to 1987 (six on the first team, three on the second team), and that doesn't even begin to describe how destructive he played on that end (only Scottie Pippen rivaled his talent for completely disrupting another team's offense). When the Celtics traded for him before the '84 season, they did it because they needed someone to shut down Philadelphia's Andrew Toney, who tortured them in the playoffs every spring. As it turned out, the Sixers never beat them again. Also, every Celtics fan remembers how the 1984 Finals turned when DJ demanded to guard Magic before Game 4 (Magic was a shell for the rest of the series), or DJ's singular obliteration of Robert Reid in the '86 Finals. An all-defensive team for the past 30 years cannot include anyone other than these five guys: DJ, Payton, Pippen, Ben Wallace and Hakeem. Nobody else qualifies. 2. DJ will be remembered by everyone who was there as one of the best big-game guards who ever played. Basically, it's Clyde Frazier, Jerry West, Sam Jones, Reggie Miller, Michael Jordan and DJ on the list. From 1978 to 1988 with three different teams, DJ played in six NBA Finals and two other conference finals, going down as the best all-around guard for 11 straight seasons on teams that won 47, 52, 56, 57, 46, 53, 62, 63, 67, 59 and 57 games. He averaged 17.3 points, 5.6 assists and 4.3 rebounds for his playoff career -- including an astonishing 23-game run for a banged-up '87 Celtics team on which he averaged 19 points, 9 assists and a whopping 42 minutes a game guarding the likes of John Lucas, Sidney Moncrief, Isiah Thomas, Vinnie Johnson and Magic. 3. Larry Bird called him the greatest player he ever played with, which seems relevant since the Legend played with six members of the NBA Top 50 (McHale, Parish, Walton, Archibald, Cowens and Maravich). All of them are in the Hall of Fame. 4. In 14 seasons, DJ played in 1,100 of a possible 1,148 regular-season games, only missed more than five games once (missing 10 in the '89 season, near the tail end of his career) and played in another 180 playoff games (11th on the all-time list). The guy was built like Russian oak. DJ was a defensive master but also averaged 14.1 points per game in his 14-year career. 5. He's on the all-time "We'll never see this guy again" team along with Barkley, Bird, Magic, Maravich, Gervin, McHale, Kareem, Adrian Dantley and wholly unique players from NBA lore. There's never been a guard like DJ before or since. And it's the last paragraph that should have clinched his spot in the Hall of Fame. 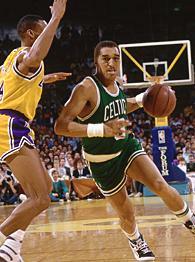 Could you compare Dennis Johnson to anyone on the planet? He splashed onto the scene as a high-flying, physical 2-guard for the Sonics, evolved into more of a scorer for the Suns, then reincarnated himself as a heady point guard for the Celtics, peaking as the ringleader of a loaded '86 team that scored a jaw-dropping 114 points a game. He could guard anyone shorter than 6-foot-9 and lock them down. He was such an intelligent player that Bird and DJ had a secret ESP play for six straight years, in which Bird would linger near the basket like he was waiting for someone to set him a pick, then DJ would whip a pass by the defender's ears and Bird would catch it at the last possible second for a layup (and the only way that play happened was if they locked eyes). He was one of those classic only-when-it-counts shooters who could be riding a 3-for-14 game into the final minute, then nail a wide-open 20-footer to win the game. Everyone loved playing with him in Boston; he was so competitive and carried himself with such a swagger, I can't remember following anyone other than Bird who enjoyed the actual process of winning more than him. There's a great scene in the '87 team video when the Celts are boarding the bus after a Game 6 shellacking in the Pistons series. Sulking about Dennis Rodman's antics at the end of the game (Rodman had been running around waving his right hand around his head), DJ sarcastically waves his hand over his head and says something like, "Yeah, OK, we'll see what happens on Sunday." Sure enough, the Celts pulled out an absolute slugfest of a seventh game, with DJ following Rodman around in the final seconds and sarcastically mimicking Rodman's high-stepped gait while waving his hand over his head. The lesson, as always: Don't mess with the Celtics. I loved so many things about watching him play: The way he'd suddenly strip an unsuspecting guard at midcourt (you NEVER see that anymore), almost like a pickpocket swiping a wallet; the ESP plays with Bird; the supernatural way he rose to the occasion in big moments (like the game-winner against the Lakers in Game 4 of the '85 Finals); his unsurpassed knack for grabbing big rebounds in traffic; the way he always made one huge play in a must-win game (my personal favorite: in Game 7 against the '87 Bucks, when he went flying full-speed out of bounds to save a loose ball in the final 90 seconds, then somehow whipped it off Jack Sikma as he careened into the entire Bucks bench). Every time I get sucked into an old Celtics game from the '80s on ESPN Classic or NBA TV, there's always a point in the game where I find myself saying, "Holy crap, I forgot how good Dennis Johnson was." Like everything else about his career, few remember his defining moment: The waning seconds of Game 5 in the '87 Eastern finals, when Bird famously picked off Isiah's pass and dished to DJ for the winning layup. Everyone remembers the steal and Johnny Most's call; nobody remembers DJ standing near midcourt, seeing Bird moving for the pass. Even as Bird snatched the ball out of Laimbeer's hands, DJ was already moving toward the basket with his hands up, ready to make the winning shot. From the mid-'70s to right now, I can only pinpoint a handful of players who would have instinctively known to cut toward the basket even as that steal was in the process of happening -- MJ, Magic, Frazier, Stockton, Reggie, Mullin, Rick Barry, Isiah (ironically, the one who threw the pass), Robert Horry, Dwyane Wade, Jason Kidd, Iverson, Nash, Kobe, and that's about it. Nobody else starts moving until after the steal happens. And by the way, if DJ never made that cut, Bird would have been forced to launch a fall-away 10-footer over the backboard to win the game -- which he probably would have made, but that's beside the point. One more thought on that layup: the replay never does it justice. DJ was going full speed, hauled the pass from the left, then had Dumars coming at him from his direct right, so he had to shield the ball from Dumars, turn his body to the left and make a reverse layup that was much harder than it looked. My father and I were sitting on the opposite side of the main CBS camera, right in the tunnel where the players entered and exited (you can even see us at the end of this particular game), so you have to believe me on this one: that layup almost missed. Dumars changed the angle at the last second; DJ's layup struck the right side of the rim and somehow dropped home. Believe me, the layup was just as tough as the steal. Of course, few people remember this, just like few remember how great of a basketball player Dennis Johnson was and how special and dominant that '86 Celtics team was. As my father said on the phone today, "He was the best guard on the best team I ever watched in my entire life." Me, too. He should have made the trip to Springfield when he was still alive. Instead, he'll be making it in spirit some day. Didn't have to be that way. If you're reading this, and you have a Hall of Fame vote and you didn't vote for Dennis Johnson the last few years, hang your head in shame.